Happy FRIYAY everyone! We are back from our very rainy Venice trip and looking forward to a fun filled weekend as my Momma leaves Thursday so we must make the most of it while she is still here. This week has been a great one being in Venice and also having my mom here for her birthday with the kids. We haven’t had a moment to spare and I love that when she visits but it also means it goes way too fast. I start getting emotional when I think about her leaving and how we can’t just meet up for a coffee or go to her house for Sunday dinners like most people can. I wish I had that so badly but to stay positive let’s look back on some #littleloves this week that made me smile. 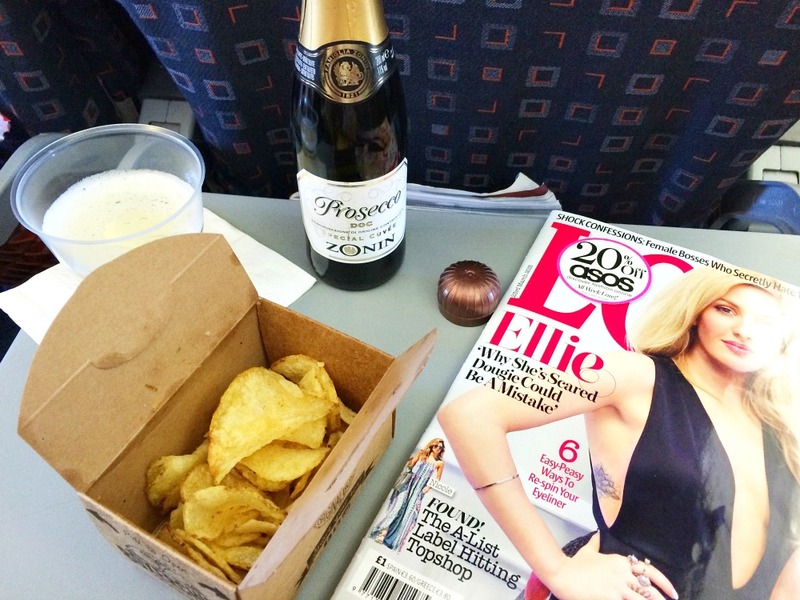 I can’t believe I had the chance to sit down and reading a whole magazine from front to back, on an airplane with Prosecco and chips at my side and no sticky fingers trying to intrude or sitting on my lap. It’s been a long time since I traveled without my kids on a plane and it was blissful. I read each page slowly and poured over the photos like the good old days. I love this song and it’s absolutely my favorite song to use for family day trips out on my youtube videos too. Love the raspiness in her voice. It’s a great one to bookmark. We had a minor glitch for Bloggers Insight in February but I am back on track with a great interview from the lovely Katie from Mummy Daddy Me sharing her photography knowledge with us all. 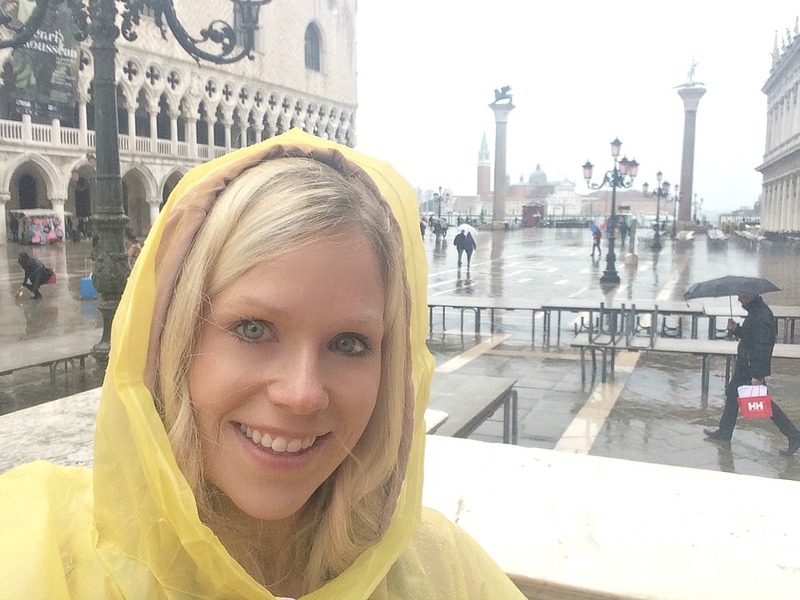 I wore my poncho all week in Venice to help keep a little warm, I would say dry but as you can see behind me that was impossible. Of course, I had to scoop up my awesome poncho in yellow from the street venedors! People were even abandoning their umbrellas because the wind was quite fierce on the second day we were there but with our ponchos on, my mom and I were not going to let the rain slow us down. I am totally cheating on the “made section” as I attempted to make Salted Chocolate Brownie Cookies last week and they came out absolutely horrible. So badly made, I had to throw them away and that’s only the second time I have ever made something inedible but I was highly disappointed. Other than my melting mess of chocolate heap, I made a lovely bubble bath in our Venice hotel. We got upgraded somewhere in the mix of reservations and ended up with the biggest room ever and it had a jacuzzi tub with powerful jets and I “made” the bubbles and made the most of a quiet bath time without children. Have you seen my 5 Top Tips for Food Styling, I know many of you like to drool over my food photography and ask me about how I style them so I wanted to share with everyone what I have learned so far, this past year. I have made some new “food” goals for myself for the next year for practicing my skills further and there may be a “new food blog” in the making separate to LTM. Watch this space! I’m not sure if you are supposed to put bubbles in a Jacuzzi bath – I know some-one who nearly ruined their entire new bathroom doing just that! I would totally do it in a hotel though, it looks amazing! Glad you had a great week, and hope you enjoy the rest of your time with your mum! Oh no! Oops well thank goodness it was a hotel then. Hehehee it was blissful. Thanks Lisa. Oh yes my momma and I are great at making the most of things even on the rain. Thank you Alice. Me too. Yes I think I got a few food umbrella wacks in the face. Oh thank you darling. Glad you liked it. Yes we made the most of it rain or shine we are good like that. ahh bless you. I hate when family have to say goodbye. It tears me up. Thanks Donna. The bath was luxurious and the room was like a palace for sure. We made the most of it and the poncho helped keep us warm maybe not dry but warm. lol Oh yes chips and bubbly go hand in hand for sure. You have a lovely weekend too. Oh yes it was very inviting having a hot bubble bath after walking in the rain and wind all day sightseeing. We sure made the most of it anyways. Thank you Jude. Yes we are having a great visit (as always) my momma and I are close so it’s not hard to make fun out nothing. lol Love traveling with her. Although I am super sad she is leaving already on Thursday! Boo. Thanks Jess, yes we are good at making the most of things even when it’s really crappy. We were wet and cold but we saw some beautiful churches, and palace and a very wet gondola ride that was still amazing. Thanks Katy so lovely of you to say. Yes silver lining right? Lol ponchos were funny. Oh wow, I have massive bath envy. We are having our bathroom done at the mo. It is currently looking well and truly crap. I have to say, making a fabulous bubble bath would be my preference any day over chocolate brownies. Oh yes bubble bath over goodies any day. The peace and quiet and relaxation is a must. Good luck with your remodel. Thanks Natalie. We had fun making it for sure. Venice is great. What a shame it rained so much on your trip! It sounds like you managed to have a nice time anyway though, and I bet it was good to spend some quality time with your mom. I can’t remember the last time I had a bath!! Thanks Charlotte. Oh yes rain or shine I love traveling with my mom. We always have a blast.